A friend once said, "I thought people who complained of chronic back pain were babies, until I injured my back. Now I understand." 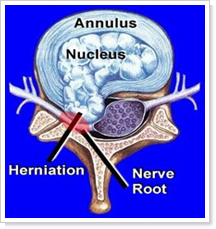 Herniated discs are common causes of low back pain. They can cause dull aching pain or severe sharp stabbing pain with muscle weakness and loss of feeling. The pain will often radiate from the back down the leg. The severity of symptoms and the time it takes to heal varies depending on the extent of the herniation. If our spines were one solid piece of bone we would be stiff and unable to move. Our spines were built with multiple moveable pieces to allow us to bend, twist and rotate. The hard spinal bones, or vertebrae, are separated by discs. The discs have a tough outer covering and a fluid filled inside. 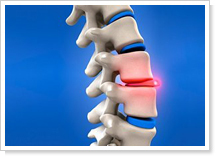 The discs serve as shock absorbers between the spinal bones and safely allow the bones to move. Discs can be thought of as jelly doughnuts. If they become injured or torn, the jelly can be squished out toward the spinal nerves. The "jelly" release will cause inflammation and put pressure on the nerves resulting in pain, muscle weakness, or change of sensation. More severe injuries will cause more "jelly" to be pushed toward the nerve, creating more inflammation and problems. Free Chiropractic or Physical Therapy Evaluation or 6 decompression treatments for $200. (Insurance often covers treatment and your costs could be less). What are some causes of herniated Discs? Disc problems are associated with age-related degeneration, or years of wear and tear on the discs. Years of repetitive stress cause small tears on the outside of the disc. Combined with age-related water loss in the disc, repetitive stress causes the discs to become less flexible and more prone to damage. Eventually, a small movement or twist will cause the disc to rupture the "jelly" toward the nerve. The "jelly" will cause inflammation to form and will create pressure around the nerves, and this will result in radiating pain, loss of sensation, decreased muscle strength or decreased reflexes associated with disc problems. What are the risk factors of herniated discs? Discs injuries are a factor of time, force and repetition. Herniated discs are more prone in occupations that involve repetitive lifting, bending, twisting, pushing or pulling. Jobs that are physically demanding obviously place more stress on the discs and lead to greater injuries. Additionally, jobs that involve extended periods of standing or sitting also have greater rates of disc injuries. Sitting actually places more stress on the discs than standing, and sitting for extend periods of time can be just as damaging to the back as lifting activities can be. Other factors that increase disc injuries are associated with forces placed on discs or factors that affect the disc's health. Extra body weight places more stress on the discs and older discs are less pliable than younger ones. Previous injuries create weakened spots in the discs and increase likelihood of further injury. Smoking and diabetes affect the health of the discs by limiting oxygen and nutrients to the discs. How are disc injuries diagnosed? 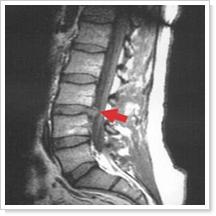 Discs injuries are different from other low back injuries because of the "jelly" affecting the nerve root. Treatment of the injuries will therefore be different than a simple muscle sprain, so it is important to correctly identify disc injuries. Disc injuries can be identified through a physical exam, whereby certain tests will identify the type and severity of symptoms. If pain is radiating down the leg, the doctor will probably test muscle strength, reflexes and sensation, as these factors can be affected by disc herniations. Additionally, MRI and X-Ray may be utilized for further information and may also be used to rule out other causes of low back pain. Are there complications of disc herniations? Since the symptoms associated with herniated discs are caused by increased pressure around a nerve root, additional pressure can cause severe damage to the nerve. In extreme cases, the pressure can cause equine syndrome whereby the extensive pressure increase will cause loss of bowel or bladder control, significant and increasing pain, and a loss of sensation in the inner thigh and back of legs. This is an emergency medical situation that requires surgery. Most disc herniations can be treated through conservative methods that involve reducing stress to the disc, relieving muscle spasms, and increasing joint motion. Light exercises and stretches prescribed by your healthcare provider will speed recovery and prevent future problems. Chiropractic therapy will improve the joint motion, will relax the muscles, and will reduce pressure on the disc. Distraction therapy, which involves directly taking pressure off the disc and reducing pressure on the nerve root, can also be employed. These techniques can be safely performed by a licensed professional and will quickly reduce the pain and discomfort. Most people will feel some immediate relief after therapy. Modification of activity and identifying activities that increase stress to the disc is very important, and this will be addressed by your healthcare professional. Disc injuries commonly take several months to completely heal, so it is important to recognize and reduce risk factors and activities that will cause the injury to reoccur. Long term goals of therapy are to properly strengthen the core musculature to prevent future injuries to the discs. Establishing better core muscle control will reduce future stress to the disc and spine, thereby reducing future injuries. Research has shown tremendous improvement in strengthening the core muscles and reducing back pain, particularly in patients with chronic low back pain. Medications are often combined with treatment to reduce inflammation and muscle spasm and to decrease pain. Surgery is performed in cases that fail to improve with proper conservative treatment. How do I prevent disc injuries? Several factors will help prevent disc injuries which include proper exercises, maintaining a proper body weight, and improving posture. Poor posture places bad stress on the disc, especially with extended periods of sitting or improper lifting. Low back injuries are often associated with poor control of the core musculature which leads to re-injury. Specific exercises will improve this performance and improve quality of life. People who properly retrain the core musculature will see a decrease in future occurrences and reduction in low back pain. See Chiropractic Services (exercise ball) for more information on core strengthening exercises. As every individual has different levels of strength and injury, it is important to seek professional help when trying to rehabilitate core strength after low back injuries. Many people make the mistake of starting exercise programs that are too intense, and eventually lead to injuries instead of preventing them. Call Alpha Chiropractic today to begin your proper disc injury rehabilitation program at (480) 812-1800.